Ceiling fans are widely used in people's daily life and industry because they have the following characteristics. air-conditioning, such high-power appliances, are increasingly restricted. the ceiling fans are relatively more expensive than air conditioners. The air conditioner is equivalent to the power consumption of 20 electric fans. When the temperature is less than 30 degrees, the fan can fully achieve the effect of cooling and heat transfer. which will make the indoor and outdoor temperature difference too much. so many countries in foreign countries recommend it. Ceiling fan is an energy-saving appliance. The ceiling fan has a front and back switch for winter and summer. but also prevents air-conditioning syndrome. In winter, it is reversed, and the fan blades are reversed, which can press down the hot air rising in the room. People in the room can't feel the wind, but it increases the air circulation. In the room with the heater, it can increase the warmth. The convection rate of the air makes the indoor hot air evenly warm as spring. observation, you will almost feel that there is no sound when the ceiling fan is running. An important part of the ceiling fan production is the ceiling fan stator. Generally, the ceiling fan stator has a 32-slot structure. The main and auxiliary coil windings are each 16 slots, which are divided into inner and outer rings. And There are 4 outlets in the two winding coils. 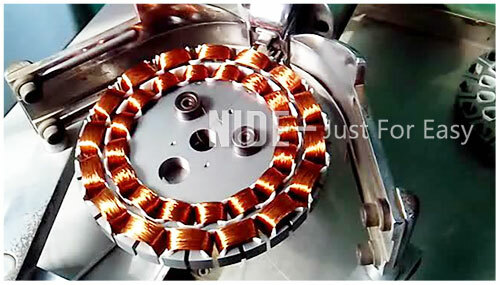 Our ceiling fan stator production can be divided into three steps: ceiling fan motor stator insulation paper insertion process, ceiling fan motor stator winding process, ceiling fan motor stator Impregnation Varnish Dripping process, and the ceiling fan stator insertion and ceiling fan stator winding are 2 times each. 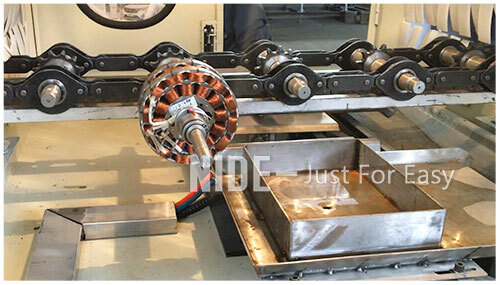 Only manual loading and unloading the ceiling fan motor stator , other process machines are automated, which greatly improves production efficiency and saves production costs. 1. Insulations paper Insertion process. Firstly, inserting the insulation paper into the inner ring of the ceiling fan motor, and then complete the winding of the inner ring of the ceiling fan motor stator. Further inserting the insulation paper into the outer ring of the ceiling fan stator. The winding result of the inner ring will be affected. and the insulating paper of the outer ring would be damages. 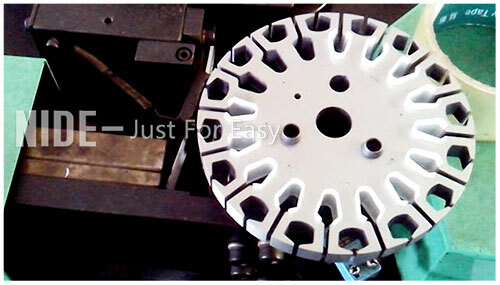 After the insulation paper insertion about inner ring of the ceiling fan motor stator, winding the inner ring of the ceiling fan stator , and then the outer ring of the ceiling fan stator is inserted into the insulation paper. 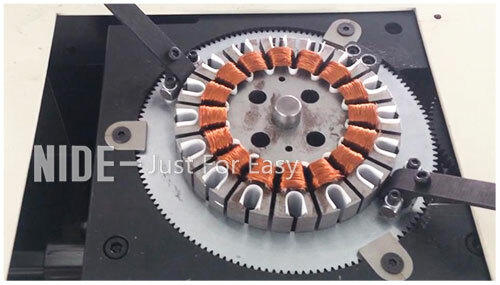 Finally, the outer ring of the ceiling fan stator completes the coil winding process. 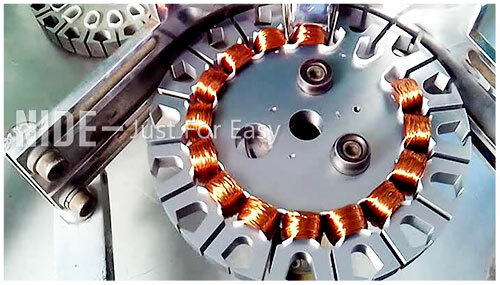 After the ceiling fan motor stator winding, the fan stator fan starts the Impregnation Varnish Dripping, help the enameled wire of the stator can be fixed, so that the coil is not loose and the wire is not twisted, the friction between the wire and the wire is reduced, and the insulation performance of the stator can be increased. 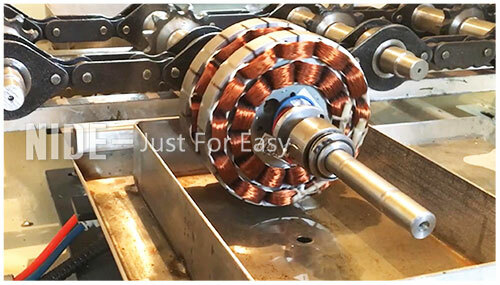 Increase the heat transfer speed, isolate the moisture, separate the coil, and greatly extend the applicable life of the ceiling fan stator.